The stop-motion animation studio behind Coraline and ParaNorman ups the ante with their latest release The Boxtrolls, a deliciously dark, witty and visually inventive adventure-comedy of particularly high quality. 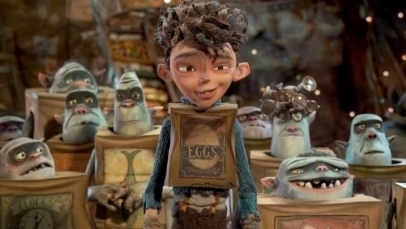 Eggs (Isaac Hempstead Wright), a young orphaned boy, is forced to face reality when his cave-dwelling captors, otherwise known as the Boxtrolls, come under attack by Archibald Snatcher (Ben Kingsley), a dastardly tyrant with big aspirations. With impeccable technical detail, right down to the fiddly parts (i.e. the brilliantly bizarre Boxtrolls), the film crackles with panache and peculiarity throughout, in which the world of Cheesetown and its various inhabitants comes to vivid life. Through their voice work, the actors breathe life into the already well-crafted script (Richard Ayoade is a particular treat as one of Archibald’s cronies), and the humour bears in mind all demographics. But there’s a depth to the film as well, with various themes of acceptance and identity touched upon, and the fact they’re delivered at all, let alone within such a charming exterior, makes The Boxtrolls a delight that keeps on giving. This is a movie I do want to see, although I think I’m more interested in it because it’s stop-motion animation than because I’ve been intrigued by the premise.